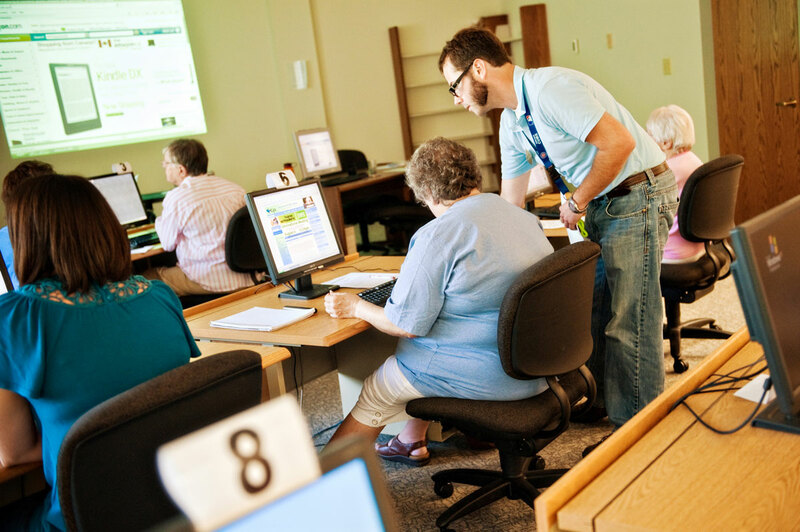 Greenwood Public Library offers computer instruction to the public free of charge. The following classes are held on a regular basis, following a regularly rotating session schedule: Jan-Feb, Mar-Apr, Aug-Oct, and sometimes Nov.-Dec.
You can sign up here http://greenwoodlibrary.evanced.info/signup/Calendar by searching "Word" or "Excel" or by calling the reference desk at 317-885-5036, or stopping in. Basic Word - View Handout Topics include terminology, menu options, text formatting, and copying and pasting text. Prerequisite: Introduction to Windows or equivalent experience. Advanced Word - View Handout Learn how to insert images, make labels, and format tables. Prerequisites: Basic Word or similar experience. Excel 1: The Basics & Beginning Formulas - View Handout | Workbook Learn how to type in Excel cells, format spreadsheets, and use AutoSum. Students must be very proficient with the mouse and know how to use formatting (change font name, bold type, etc.) in Microsoft Word. Excel 2: Formulas and Much More - View Handout | Worksheet Build on the skills learned in Excel 1 by using formulas, sorting, freezing/hiding panels, and much more. Prerequisite: Excel 1. Excel 3: Linking, PivotTables, vLookup, & Macros - View Handout | Excel3ClassSpreadsheets | SalesSheets This class builds on the knowledge of Excel 1 and 2 by linking spreadsheets, creating PivotTables, and utilizing vlookup. We'll also tinker with macros. Prerequisite: Excel 2. Class sizes are limited, so pre-registration is required. Register by calling 885-5036 or online through our Events Calendar. Please cancel by phone if you find you are unable to attend. Schedule a session with a librarian by clicking here or calling the reference desk at 885-5036 for one-on-one instruction and more involved assistance. Brief technical questions can be answered by any of our librarians at the Adult Reference desk.